v2.5: Updated with results of 102nd and 103rd Grey Cups, location of 104th Grey Cup and other minor grammatical changes. v2.0: Updated with results of 100th and 101st Grey Cups, added locations of 102nd and 103rd Grey Cups and other minor changes. 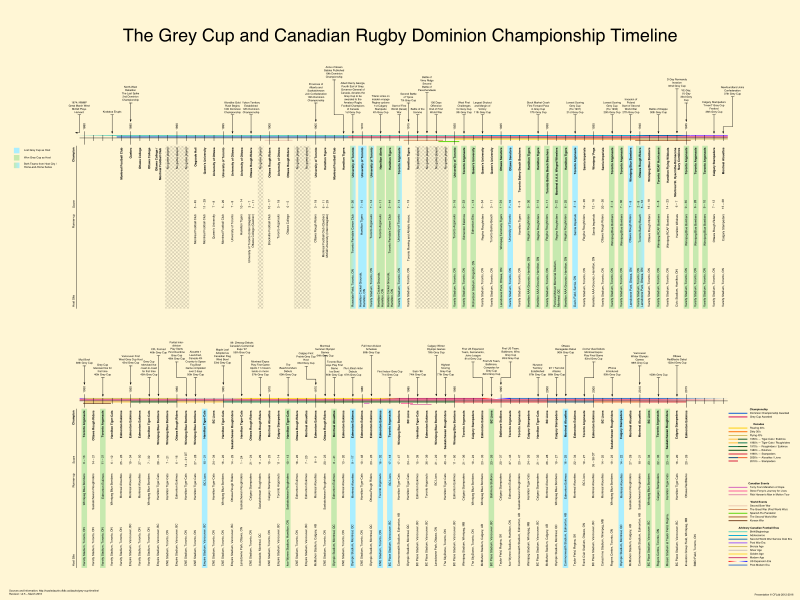 This infographic contains the winners of the 19 Dominion Championships and 101 Grey Cup Championships since the origins of Canadian Rugby Football, what has become Canadian football. Information includes the winners, runner-ups, scores and host location of the game. Also included are historical events that occurred over these 120+ years in Canadian and world history to put things into perspective. Decades, from 1950 on, lists the team with the best winning percentage in each half of the decade.